So, you are the type of successful and progressive company which understands that happy employees make productive and innovative workplaces; right? You use English in your day-to-day operations, and perhaps you already provide traditional Business English classes to ensure company growth, and support employee professional development. However, why not get your employees away from their desks and inject some fun and agile creative thinking into the way they use English? 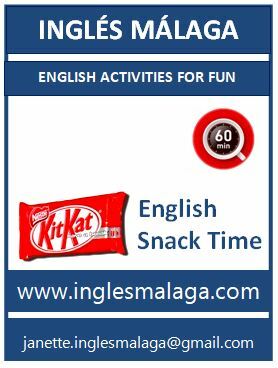 Perfect; the Inglés Málaga English Snack Time programme is a great way to do it. What is English Snack Time? English Snack Time is a varied programme of team-based activities, and quick fun office games which are designed to encourage employees to interact and communicate in English in a fun way. The training idea is based on research that indicates short, regular training is usually more effective for business needs than traditional training models. English Snack Time activities are facilitated by professional English trainers with industry experience. English Snack Time activities are time-efficient as they are delivered in-company, at a time convenient for you and your employees. English Snack Time activities can last from 60 to 120 minutes depending on the number of participants, the activity, and your specific requirements. We can develop bespoke activities to emphasise and reinforce your core values and company culture. We can design custom-built games to address your company´s English language communication issues. We can adapt activities to suit the English level of your employees, the time constraints of your workplace, and the number of participants. English Snack Time can supplement the traditional English classes you already provide, or work as an alternative method to support English language improvement. Costs vary depending on the activities and the number of participants. However, depending on your company, English Snack Time should be tax deductible. Great: It´s a win-win! Inglés Málaga ofrece otros cursos y cursos complementarios, también hay clases y eventos adicionales que pueden ayudar a lograr tus objetivos. Para más información, consulta:Inglés Málaga Cursos.